Enjoy these savory, sweet, and always authentic edible treasures. The recipes in this book highlight seasonal bounties and four major Caribbean flavors, resulting in a basketful of healthy recipes (many vegetarian), which the author refers to as edible treasures.” This innovative cookbook presents a new way to look at the four seasons through four ingredients that are integral to Caribbean flavors and culture but available everywhere. 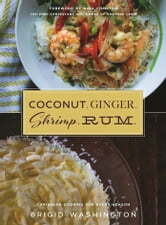 Coconut, ginger, shrimp, and rumeach boast unique health benefits, but are still simple and fundamental ingredients that will take any cook through the year, and especially highlight seasonal ingredients! Books related to Coconut. Ginger. Shrimp. Rum.